With special access to internal documents and insights from Hearthstone designers, Shacknews takes an up-close and in-depth look at the iterative process behind card creation, by focusing squarely on one card from the new Blackrock Mountain set. Hearthstone: Heroes of Warcraft is finishing its second adventure-based expansion, Blackrock Mountain, today. It adds 31 cards in all--but just what goes into designing a card? With some special access from Blizzard and insights from designers Ben Brode and Mike Donais, we're examining the process of designing a card from start to finish by taking an up-close and inside look at one of the new cards in the BRM set: Blackwing Technician. 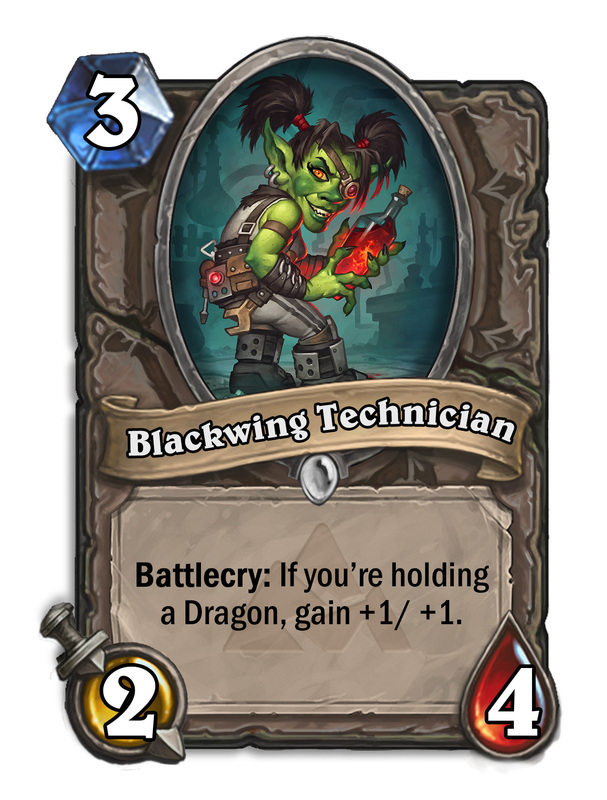 Blackwing Technician is bound to be a staple in new dragon-centered decks. As a 2/4 for 3 mana, it enjoys healthy vanilla stats for the cost. But, if you're holding a dragon in your hand, it gets a +1/+1 boost. Such a mechanic might appear simple as a finished product, but as Blizzard's internal documentation shows, it took a lot of revision and iteration to get to this point. In fact, Team 5 tested ten different versions of the Blackwing Technician, many of which sported wildly different stats and abilities. The very first Blackwing Technician had the same vanilla stats and mana cost, but a very different ability. Instead of the holding mechanic, it gained +2/+2 every time you drew a Mech or Dragon. So, simply by filling your deck with the two tribal types, you could make it a 4/6, then a 6/8, and so on. Similar to its final ability, this gave your opponent some information about your hand, but not much. It also played well within the lore, letting the Blackwing Tech enjoy benefits from two different tribes that both made sense. "It started as a top-down design and became a bottom-up design during development," Brode told Shacknews. 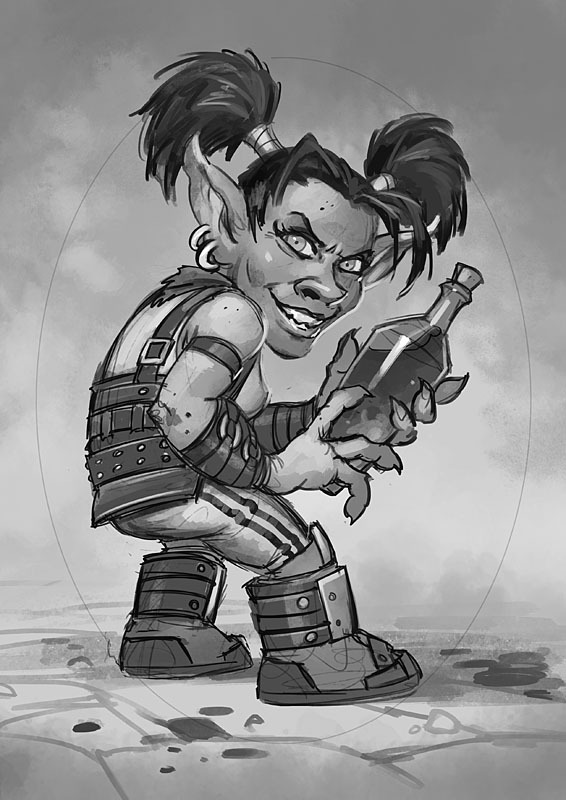 "At first, I was thinking it would be cool to have a card that carried on the mech theme from Goblins vs Gnomes. 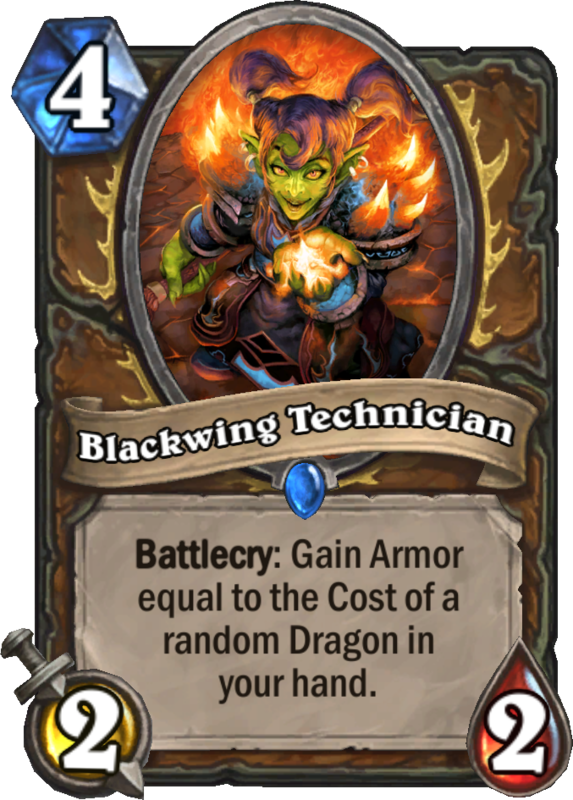 The Blackwing Technician was this cross between the dragon world of Nefarian and the mechanical thing from Goblins vs Gnomes. So the very first designs we had was exploring a mech and dragon theme together, because I had a design goal: this guy does both things." Ultimately, though, Team 5 decided this ability was far too powerful. Plus, Brode said, Adventures are best when they're narrowly focused, and support for various deck types is better reserved for full expansions. The team nerfed the ability to +1/+1, but even that was met with some harsh feedback. Players didn't like the dual tribal, because it made deck-building more confusing. The card text was also unclear as to whether her ability triggered only while in play, or if in your hand--similar to Bolvar Fordragon from the Goblins vs. Gnomes expansion. This kind of rapid iteration is the usual for Team 5 near the beginning of the process--Brode noted that during the Alpha, they had four or five keywords that were ultimately stripped from the final game. Still, none of these solutions felt quite right. They needed a design goal, and they wanted to make a card that would encourage the player to fill their deck with the larger dragons. They wanted dragon decks to feel different than Murlock and Mech decks, which are often low- or mid-range. Dragon decks should feel big and powerful, and so they should reward deck-building that includes 9-drops like Alexstraza and Ysera. "The initial goal that we were going for was trying to find ways to make dragons feel different than mechs, or murlocs. And I think for me the difference, what makes a dragon deck feel like a dragon deck, is the mana cost," Brode said. "A murloc deck tops out pretty low, but in a dragon deck you want to play 9-cost dragons. It feels 'dragon-y.' So ways to let you have big-cost minions in your deck, without having to wait until turn 9 to see the benefits of them, is what we were exploring." So what would encourage a player to do that? The next solution was a very specific Battlecry: "If you have a Legendary Dragon, Gain 5 Armor." This new design very explicitly pushed players toward the beefier dragons, but now it felt too "designer-y"--their term for when a card pushes the player in a direction that's too specific. Brode says those solutions are "inelegant," so they need to make sure cards are flexible and subtle. "We talked about counting the cost of the dragon in your hand so we would encourage you to play big dragons," Donais said. "So okay, we want to get to the number nine. What could we do with the number nine? We could deal damage, we could heal, or we could gain armor. Dealing damage was a little too crazy, so we discussed more armor or healing. We wanted these cards to be the things you played early on to keep you alive until you played your big dragons. We decided to go with armor, so we had to go with Warrior, Paladin, Druid--those are the classes that gain armor in World of Warcraft. The idea was that, hey, druids and dragons kind of work together in World of Warcraft." The feedback, again, was not positive. The idea of a "technician" didn't make much sense for a Druid, and the Armor ability made it feel out of place. Blackwing Technician was still in limbo. Donais said they were all over the place, and lacking cohesion, so he set about solving the problem. "I played a bunch with the new dragon cards and thought about them some," Donais said to the team in an e-mail at the time. "Some of them are working out ok, but some are more complex/wordy than I would like." He proposed a new card, nicknamed Dragonkin, that would gain +1/+1 if the player was holding a dragon. It was only a 1/4, but the idea was the same as the finished Blackwing Technician. "This mechanic is simpler than some of the others and cleaner/less words. Let me know what you think, we can also iterate on the exact designs, these are mostly to show the concept." And so the Blackwing Tech went back to a Neutral minion, kept its original stats with the new proposed Dragonkin mechanic, and went out into live testing. The response was immediately positive. The team found it gave the card a strong sense of fantasy, and encouraged building a dragon deck. Not only that, but it added a new wrinkle to play, by warning your opponent about dragons. This also fulfilled their desire to make it clean, simple, and subtle. Donais explained that costing the minion at 3 mana means you'll probably want at least a couple four- or five-cost dragons in your hand. Since there are only a few of those, you'll probably also include a few more of the higher-cost dragons that the team wanted to encourage. Meanwhile, the holding mechanic has gotten further iteration in the Adventure itself. The boss dragon Chromaggus gives the player harmful cards, making you choose between spending mana to get rid of them, or taking the bad effect. Brode says the jury is still out for him on that particular use of the holding mechanic, but he's open to exploring it. Donais sees holding as a doorway to a completely different element. "One of the things we learned from Voidcaller is that cards in hand are a good opportunity to bluff," he said. "We've seen that in tournaments, people will just not kill it. They'll let it hit them a bunch of times when they could have killed it, because of what might be in your hand: Malganis, Jaraxxus, Doomguard. You're glad it's just a 3/4 instead of some bigger demon. Bluffing is something I want to encourage more in our games." For more on Blackrock Mountain check out our Heroic Guides, along with our review of all 31 cards from the new Adventure. Interesting breakdown of their card iterations, thanks! The brief touch on bluffing is also interesting. Secrets have pretty much been calling a bluff since they made them only activate on your opponents turn. Druids bluff combo a lot. It would be interesting if they expand on it as a designed mechanic.